SHUT UP I LOVE THAT: join me to #partyforgood next week + win a free ticket! 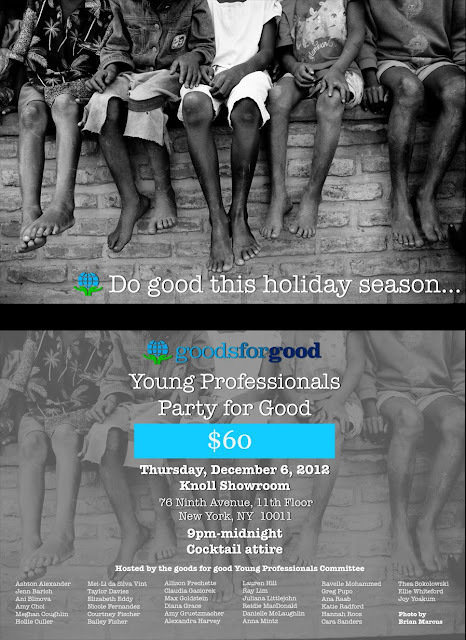 join me to #partyforgood next week + win a free ticket! You might remember that last year during the holidays, I hosted a fund-raising happy hour for goods for good at a small bar in Chelsea. What started as a small attempt just to do something good and gather friends before Christmas became the spark that lead to a much bigger (and more impactful) event this year. Pretty sweet right? You can treat your date or split the cost - either way it's a win/win. The event has an open bar (cocktails!) tons of raffle prizes (treats!) my friend Taylor as the DJ (beats!) and panoramic views (Jersey!). A little about goods for good: Through immediate goods relief, capacity building trainings and community enterprises, goods for good empowers communities to support orphans and vulnerable children in Malawi. goods for good is a registered 501(c)3.Your donation is tax deductible. goods for good is also registered with the Attorneys General of New York and New Jersey. How much fun and what a baller cause. Wish I lived in the area - hope your turn out is awesome (which I'm sure it will be). Love what this is benefitting! If I wasn't working I'd totally be there! I hope you have a great time!